Protect your retirement from the next big crash with a New Twist on the Old Investment Strategy. For years, advisors have recommended that investors take a "buy and hold" approach to the market, but people over fifty can't afford to rely on this strategy. 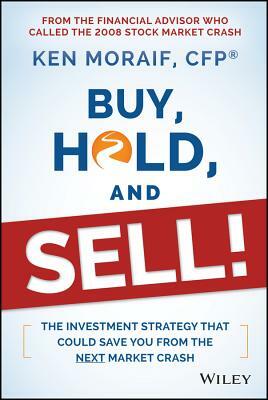 Buy, Hold, & SELL uncovers the myth of the "buy and hold" investment philosophy, and explains why it's dangerously incomplete. Written by Ken Moraif, one of Barron's top 100 Financial Advisors in the United States three years a row and who called the 2008 market crash in November of 2007, this book outlines an alternative strategy that better serves investors who are at retirement age. Written in easy-to-understand language and buoyed by Ken's trademark humor, this guide shoots down the myths that keep investors in risky markets, and arms readers with the knowledge, motivation, and strategies that may help them survive-and even thrive-during the inevitable next bear market. Too many retirees lost a large percentage of their investments during the market collapse of 2008 and spent years trying to regain their footing. During the collapse, many advisors told their clients to stay in the market. Ken did the opposite, advising his clients and listeners of his popular radio show "Money Matters" to get out of the market in November of 2007-before the economic meltdown. With this book, Ken shares his 26 years of experience to help investors prepare for the imminent bear market that could devastate their retirement plans. For those looking to build a sound financial plan for the long run, this book provides expert insight and solid advice with supporting charts, graphs, statistics, and anecdotes. Discover the benefits of a diversified portfolio This book expands upon old advice to provide the most important part of the equation: a sell strategy designed to protect principal. The goal of Buy, Hold, & SELL is not to make investors rich quick, but to help keep them from becoming poor. KEN MORAIF, CFP, has been named one of the top 100 independent financial advisors in America by Barron's Magazine (2012-2014). He heads up the financial and retirement planning firm Money Matters with Ken Moraif, one of the top 50 fastest-growing financial advisory firms according to Financial Planning Magazine. He hosts a weekly radio show, Money Matters with Ken Moraif, and is a frequent guest on CNBC and Fox Business. He has written for or been quoted by Forbes, Kiplinger's Personal Finance, MarketWatch, The Wall Street Journal, and more.